With all the drawer frames built, and assembled it’s time to glue them into position in their corresponding dados between the two sides. Glue ups aren’t all that bad on a small scale, but when you have this many pieces to put together in a short amount of time it can be downright scary if you let it. But if you take the time to do a few practice runs to anticipate where things might get sticky (pardon the pun) it’s not that difficult to formulate a plan for when you finally breakout the glue bottle and actually get started. In today’s episode we only have three things to discuss. First is a slight alteration to the existing plan, second is cutting and installing the drawer guides and third is the massive glue up itself. The first two are only a small portion of the episode, but the third is almost all the footage I shot to give you an idea of just how long it took me and all the little steps that went into it. On the bright-side, it came together better than I anticipated, but next time, I think I might ask for some help from the family to speed it up. One question on your glue strategy – you mentioned applying it just on the front and back portions of the drawer dividers. I’m not sure how that avoids any issues with wood movement of the sides – if they shrink, having the front and rear glued will still present the possibility of cracking, and if the sides expand then you risk bowing. I always over analyze the risk of wood movement, but I think in this case I might have glued the entire divider just to really lock it all in. How do you like those strap clamps? I’ve never looked into using them. I’ve enjoyed all your episodes and this one was particularly timely. I’ve been working on Marc’s Guild build dresser and I just did my first dry assembly of the entire carcass. I do not look forward to the glue up. Foolish me. Whether you’re a relative newbie like me or someone like you who have been doing this for quite a few years, it still is going to scare the crap out of you when glue up time comes. 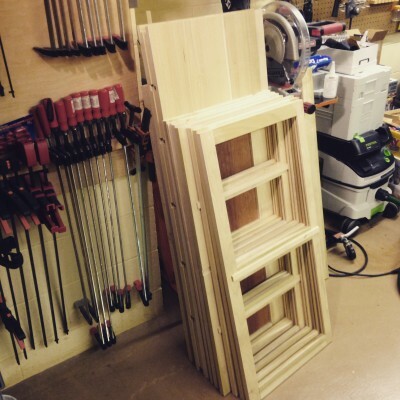 Glue ups can be the most stressful part of any build…that’s probably why I put them off as long as possible LOL. I really appreciate you showing the glue up. These are part of virtually every project, yet often times these are skipped over on shows or online project summaries. I love the multi-video projects where you can show a lot of the details in each step. Keep up the great work.